Hopedale is the second largest community in Nunatsiavut, with a population of 640. The name Hopedale came from Moravian missionaries in 1782. The Nunatsiavut Government’s Assembly building is situated in an area on the edge of Hopedale’s waterfront, overlooking its beautiful harbour, making Hopedale the legislative capital of the Nunatsiavut. Hopedale is known for it’s incredible legacy of remaining structures and Moravian Missionary buildings, as well as artifacts that date back to the 1700s. John Winters is the Imappivut Community Coordinator for Hopedale, Nunatsiavut. John graduated High School in 2012 and attended College of the North Atlantic to complete the Aboriginal Bridging Program in 2013. He attended CNA once again in 2014 to earn a Trades Certificate in the Heavy Duty Equipment Technician program. An outgoing, eager to learn, active guy who loves to travel and explore Nunatsiavut. 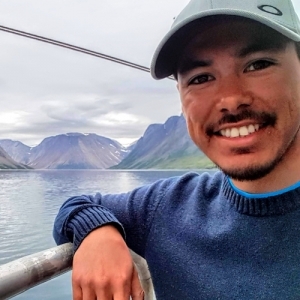 In September, 2018 John attended a Climate Change meeting which led him to become interested in areas such as protecting and implementing a marine plan for Nunatsiavut. John is now a proud member of the Imappivut team as a Community Coordinator within his Community of Hopedale. An initiative of the Nunatsiavut Government.